What symbolizes Greece more than the olive. 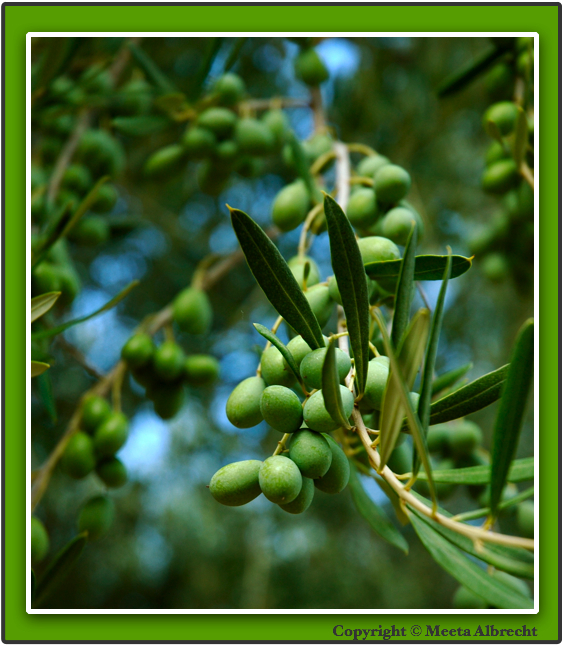 We visited an olive plantation on our recent trip to Greece and I took just this one close up. and yes the Kalamata olives are the best, but than I am very biased. Beautiful. Love olives and the trees. Thanks for your comment on my blog regarding the photo size and the sidebar getting all messed up. Infact probably while you were on my blog I was editing my template and have succeeded in doing the needful. Everything is back in place and the blog looks good again. Olive trees are gorgeous, but as a kid I learned not to eat olives off them the hard way! Nice shot! I like the contrast between the long narrow leaves and the short round olives! Lovely, Meeta! Just like a postcard. The backing colors, blue and green, infuses so beautifully! I adore olives but never see the trees, you photo makes me love them even more! Lovely pic! Lovely looking olive! I love Greece!